If you are a fan of Dan's Brown "Angels and Demons" this tour is projected to meet your needs and curiosity. If you are a fan of Dan's Brown "Angels and Demons" this tour is projected to meet your needs and curiosity. There will be no need to struggle in finding the right places and directions, as you just relax and enjoy by following your expert tour guide that will confidently take you through the Path of Illumination. The Pantheon, probably the world's best-preserved ancient monument, is the first stop, where Langdon thought the first altar was located. The church, once a roman temple, is home of the remarkable dome, with its oculus open to the sky. Take the chance to stop by Raphael's tomb, as well as the burial place of the firts kings of united Italy. 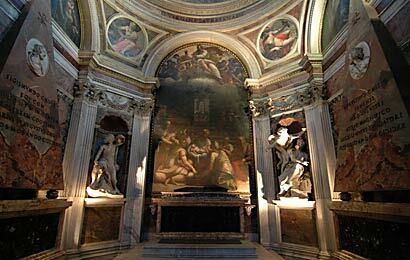 After learning of his mistake, Langdon understands that the "Tomb of the Saints" is Raphael's Chigi Chapel in Santa Maria del Popolo. This lovely renaissance church stores two Caravaggios, as well as Rome's very first stained glass windows. A quick stop in St. Peter's square will allow you to have a look at the elliptical West Ponente tile, depicting the west wind gusting from the angel's mouth. of St. Teresa in Santa Maria della Vittoria, one of the most inspired monuments of art history. The provocative centerpiece is a large statue designed to be illuminated by reflected light from a hidden window. The statue depicts a remarkable mystic experience related by St. Teresa herself, witnessed by Cardinals and Doges of the Cornaro family looking on from flanking balconies all in a classical baroque setting. The next stop will be piazza Navona, a baroque jewel saved from the roman traffic hype. This square has everything: fountains, palaces, churches, street vendors, cafès. the Fontana dei Quattro Fiumi, stands right in the middle, ready to be admires for Bernini's powerful figures of the four rivers represent the four corners of the world. Finally, you will be ddirected towards the Church of Illumination, Saint Angel's Castle at the present. This circular and medieval fortress has long been one of Rome's most distinctive landmarks, but it has been built to be emperor Hadrian's mausoleum. Klimb to the top to have your final 360° view of the eternal city.